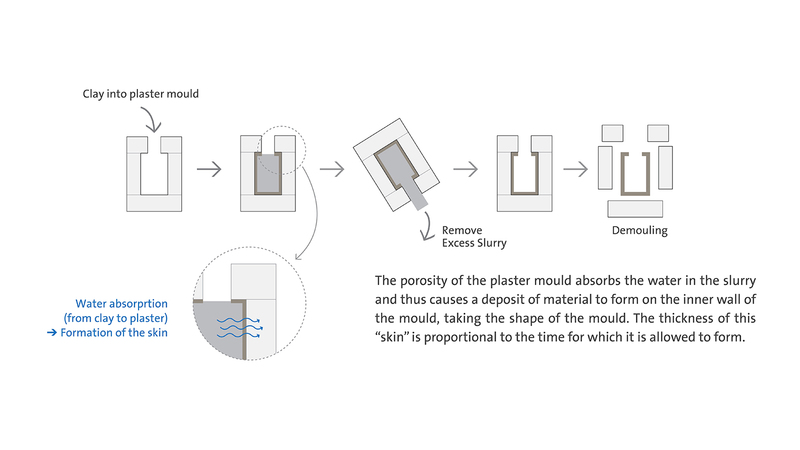 In Slip Casting, the porosity of the plaster mould absorbs the water in the ceramic slurry, taking the shape of the mould and creating the cake. The thickness of this "skin" is proportional to the time for which it is allowed to form. Saint-Gobain Formula is able to control the porosity and the absorption capacity of the moulds, allowing manufacturers to extend production speed and mould life. Each of our local manufacturing sites supplies a wide range of tailor-made solutions adapted to every type of clay such as vitreous, bone china, fine fired clay or refractories. Our solutions are suitable for slip casting, solid casting or hollow casting with several castings per day, long mould life and perfect reproduction of details. Take a look at our best practice document on the use of moulding plaster. Accurate controlled plaster to water ratio, cleaning, blending, drying, etc. We provide you with a check list to improve your process by implementing some easy actions. Molda, Anpak, Alfamolde and Supraduro MC multicasting plaster ranges have been developed to improve absorption rate and mould life in sanitaryware and tableware. Our multicasting products allow customers to improve productibity by increasing the number of casts in the same period of time. Longer casting time, even though the plaster starts to set earlier. The mechanical strength of moulds is signicantly improved, enabling a quicker release and improving mould behaviour.